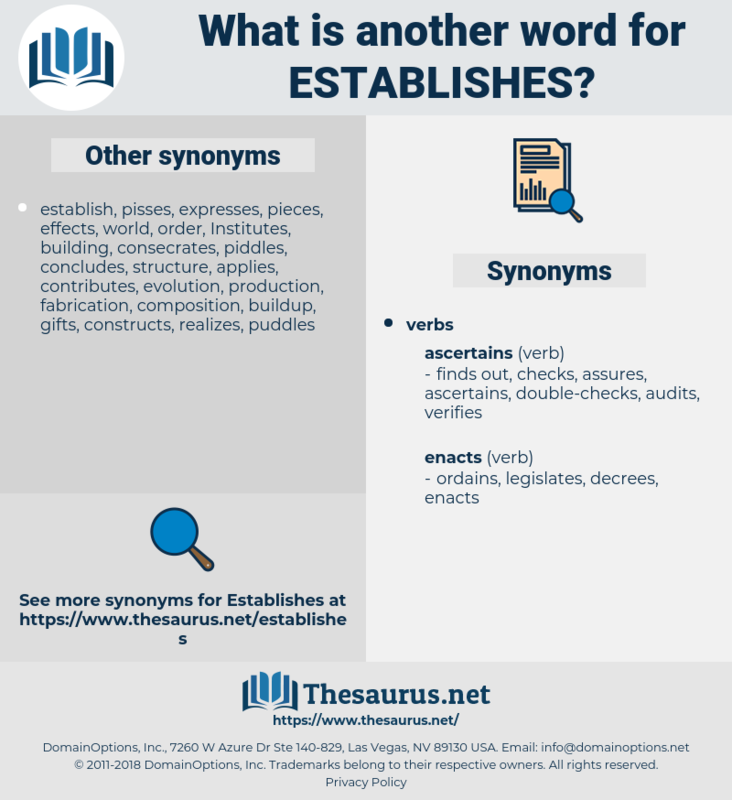 What is another word for establishes? 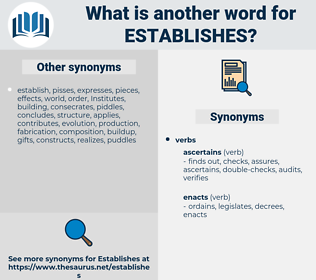 definitions, holds, puts, Bis, assess, assesses, stipulates, defines, identifies, provides. charts, issues, rules, limits, levels, lists, places, mandates, decisions, stares, guides, directors, results, fixes, frames, states, advances, causes, awards, features, offers, amounts, definitions, puts, assesses, prepares, specifies, defines, identifies, indicates, provides. consolidates, estimates, creation, illustrates, delineates, distinguishes, publishes, initiates, assembles, differentiates, administers, stipulate, characterizes, substantiates, identifying, demonstrates, formulated, generates, designates, exists, reinstates, discriminates, constructs, defining, impose, imposes, gathers, facilitates, Guarantees, settles, selects, introduces, appoints, strengthens, articulates, collects, regulates, Appointments, allocates, declares, reiterates, reaffirms, categorizes, calculates, compiles, obtains, forged, forges, corroborates, enacts, aileges, governs, punishes, arranges, clarified, clarifies, attributes, observes, lays, realises, explains, necessitates, incriminates, assigns, confirms, criminalises, proclaims, delimits, consecrates, finishes, verify, verifies, stipulations, classifies, exhibits, trace, traces, appointment, adopts, dictates, assumes, testifies, teaches, Institutes, restates, summarizes, clearly, contemplates, criminalizes, dedicates, obligates, Measures, writes, realizes, boasts, suggests, shapes, invests, separates, penetrates, prohibits, interprets, secures, upholds, undertakes, proves, Manifests, requirements, understands, safeguards, decide, assures, ensuring, ensures, launches, retains, promotes, attest, attests, PAVES, pinpoints, Hires, authorizes, directs, advises, ushers, rule, check, checks, alleges, envisions, presents, enhances, submits, elaborates, authorises, captures, influences, appreciates, concludes, bestows, emphasises, displays, appraises, enshrines, chooses, entrenches, represents, Outlining, outlines, reinforces, rates, espouses, enumerates, disposes, tells, believes, examines, manages, enforces, increases, engenders, produces, drafts, proscribes, becomes, proposes, depicts, monitors, emphasizes, reveals, resolves, highlights, shows, anticipates, predicts, admits, cites, ratifies, advocates, handles, evidence, evidenced, evidences, encourages, entitles, enables, Charges, conducts, files, adjusts, discloses, raises, bans, definition, appraisal, imports, justifies, begins, imparts, Addresses, paints, lifts, operates, finds, considers, helps, empowers, showcases, recognises, portrays, informs, relates, Bears, Levies, Leaves, protects, commits, penalizes, contributes, enunciates, signals, treats, switches, computes, renders, positions, confers, communicates, recognizes, strives, codifies, foresees, connects, hosts, audits, receives, feels, denotes, Affects, starts, reviews, derives, provokes, yields, supplies, designs, documented, documents, stop, stops, exposes, mentions, accepts, leans, claims, supports, links, leads, seeks, symbolizes, arises, obliges, announces, approves, Records, endows, Grants, moves, Comprising, comprises, speaks, argues, contains, aligns, Maps, Bases, Has, place, enjoys, notes, exempts, completes, Exercises, open, opening, opens, arrives, contends, quotes, ali, vests, applies, poses, stays, binds, spawns, charts, embraces, resides, Lives, commands, possesses, permeates, reflects, includes, owns, breeds, Comes, expresses, handicaps, Permits, sees, compels, Plays, PEGS, targets, Deems, code, follows, tosses, plans, underscores, takes, Lends, Faces, employs, decrees, works, incurs, entails, notices, aims, urges, enters, forbids, presupposes, confesses, wears, Houses, implies, uses, projects, involves, performs, adds, lacks, law, falls, stresses, pertains, says, exemplifies, seems, pits, conveys, relies, regards, consists, views, issues, sends, pays, Carries, underlines, concedes, serves, appears, attempts, remains, covers, throw, throws, ends, endorses, rules, credits, encompasses, promises, hopes, intends, embodies, epitomizes, spends, demands, reference, warrants, ranges, OKS, requires, Rests, stands, keeps, extends, honours, concerns, expects, Drives, drains, folds, rolls, turns, asks, Gives, typifies, casts, depends, controls, dumps, allows, expends, affords, pervades, occurs, founds, purports, lets, happens, passes, limits, lists, 's, places, mandates, calls, deals, flows, thinks, accompanies, begs, accounts, spins, sheds, counts, accords, looks, drops, guides, results, gets, fixes, approaches, makes, Focuses, focusses, wants, meets, runs, causes, awards, features, means, offers, goes, Does, amounts, cut, cuts, definitions, holds, creates, puts, assesses, stipulates, reads, prepares, specifies, defines, identifies, decides, indicates. implements, installs, asserts, discovers, achieves, determining, incorporates, organises, organizes, nominates, maintains, promulgates, fosters, delivers, acknowledges, erects, envisages, accommodates, Tests, pursues, forecasts, attaches, devotes, engages, draws, discusses, entrusts, refers, agrees, states, prescribes, provide, provides.